Kiwanis Club of St George’s managed to get an early start – both literally and figuratively – on the annual world-wide Kiwanis Week observances. A spokesperson said, “This week – in mid or late January – is observed by Kiwanis Clubs around the world. Kiwanis St George decided to get a head-start on the celebrations by having some of the club members be present at the round-a-bout at Swing Bridge to give a wave and a smile to motorists and cyclists going out of and into St George’s and St David’s. The weather was favorable, with bright sunshine and virtually no wind. “Shown in the photo [left to right]: Past Lt Governor Marie Kent-Smith, Past President Rose Douglas, Kiwanian Robin Warren, Kiwanian Angela Pitcher, Vice President Daron Lowe, and President Gary Kent-Smith. Also participating, but not in the photo, Past Lt Governor David Burgess. 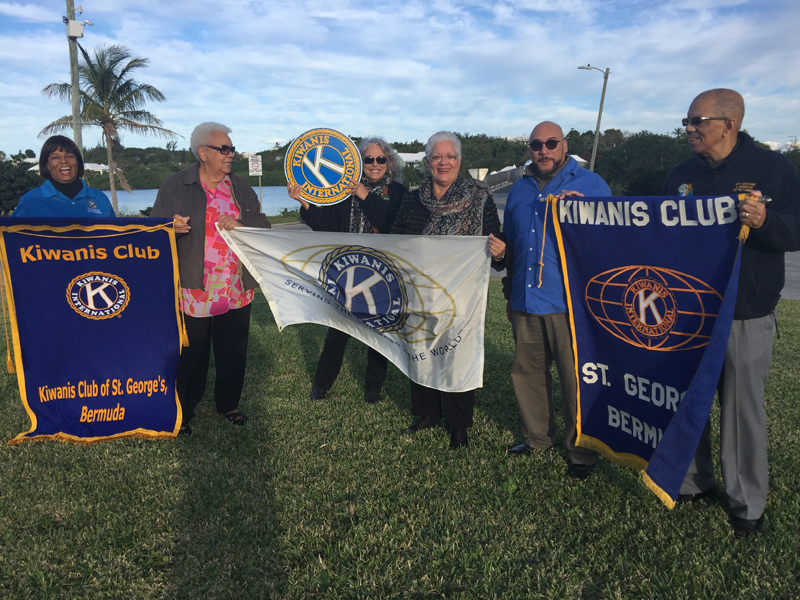 “Kiwanis St George will also hold other events in connection with Kiwanis Week: on Sunday some of the members will join other Kiwanians in Bermuda at the Vernon Temple AME Church in Southampton for their annual service. “On Monday of next week, and in keeping with their main thrust of “Serving the Children of the World”, Kiwanis St George in cooperation with the local charity SCARS will hold a workshop program designed to educate adults how to prevent, recognize, and react responsibly to child sexual abuse. This will take place at the Heritage Centre on Penno’s Wharf, starting at 6.00 pm.